Luckily, some restaurants now offer classic salads with a twist or, if you feel like taking your dose of greens at home, you can prep one such salad in your own kitchen. Here are some great ideas. Even if you are not a big fan of salads, you have certainly tried this one. It is one of the most popular salads today and that may be because it is made with ingredients that are neither expensive nor hard to find. Plus, it has an impressive name which inspires even the pickiest of diners to order it. However, given the rising vegan trend, this classic salad has suffered a blow. It contains animal products such fish fillets, eggs and cheese which is a no-no if you are a vegan. Still, if you drop the fillets and replace them with raw cashews, use non-diary milk and add extra flavor to it with Kalamata olives you will be able to take Caesar to Veganland. For those of you, who do not like to exclude anything from their diet, the Lava Rock Charred Caesar Salad can easily find a place among their top three all-time favorite salads. Instead of featuring grated Parmesan cheese and butter croutons, it includes Parmesan croutons. As its name suggests it, this delicious version of the classic Caesar Salad is also charred on a lava rock. That is why you may not be able to prepare it at home. But you can order it at The Mad Rex and enjoy a fine dining experience in Philadelphia. The classic version of Greek salad or Horiatiki salad contains cucumbers, tomatoes, Feta cheese, red onion, Kalamata olives, dried oregano and oil. It is very easy to make and even though it does not contain meat, it can be quite nutritious. To make things a bit more interesting, you can add avocado. By doing so, you will make this salad quite trendy as avocados are one of the biggest food obsessions at the moment. 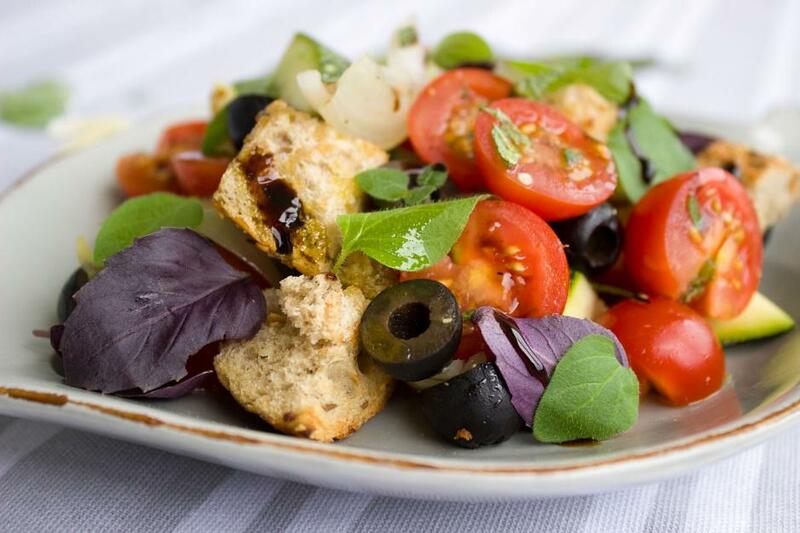 For a more drastic makeover of the traditional Greek salad add to it some fried croutons and olives, as well as a chopped dill to further elevate the taste of this amazing goodness. This is one of the most American salads you can order when dining out. It features ingredients like cheese, tomatoes, cucumbers, other vegetables (usually lettuce), hard-boiled eggs and meat (chicken, ham, beef, turkey and etc.). Meat lovers adore it because it usually includes more than just one type of meat. But if you are a vegetarian, you can skip the meat and add sunflower seeds and various kinds of vegetables and greens including ground and bell pepper, celery, red onion, scallions and chives. So, yes – classic salads are classic for a reason but adding a little twist to won’t hurt anybody.